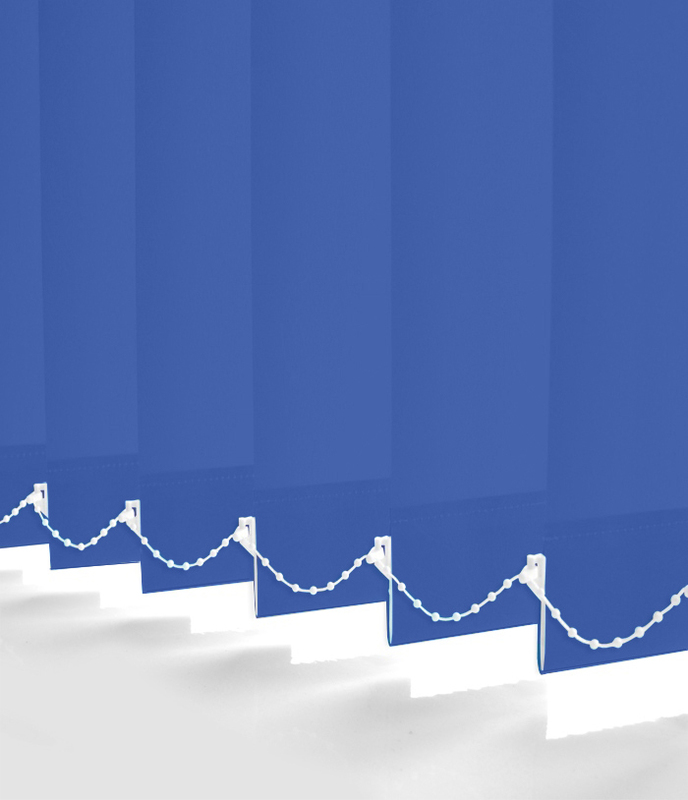 Vertical Blinds Milton Keynes remain a popular choice in offices. 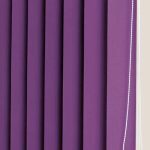 Moreover, in addition to office blinds, they prove popular with the home. Two men, Edward and Frederick Bopp held the original patent in 1950. Forming a company Sun Vertical until the companies sale in the 1960. 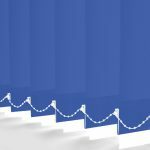 Notwithstanding the sale, popularity in these blinds rose in the following decades. 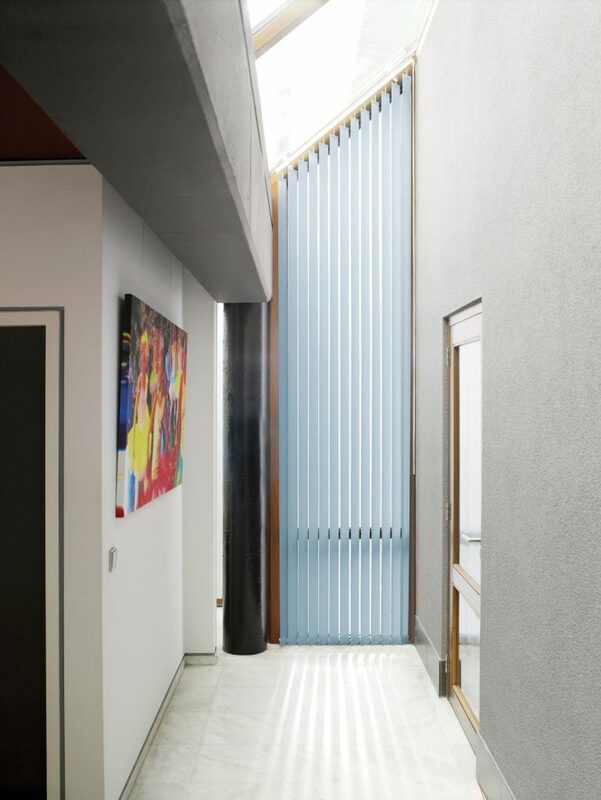 Initially, larger 127 mm or 5 inches slats became popular. 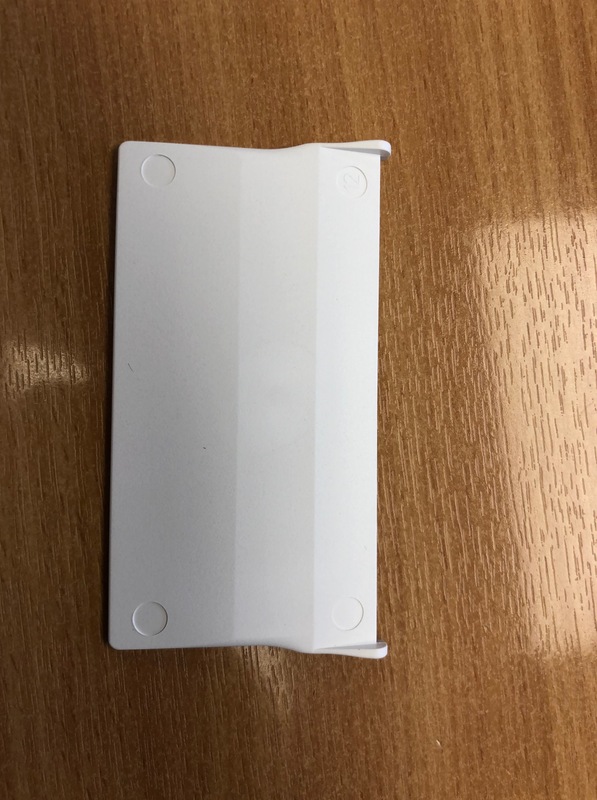 Often found in commercial buildings. Over the years, slats in 3.5 inches or 89 mm, overtook the 127 mm. 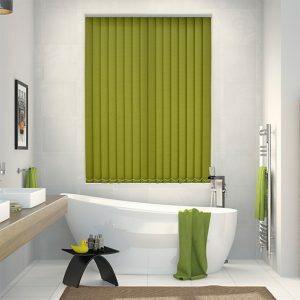 However, vertical blinds in 89 mm is a popular window blind. In addition, the blinds are increasingly prevalent within the home. 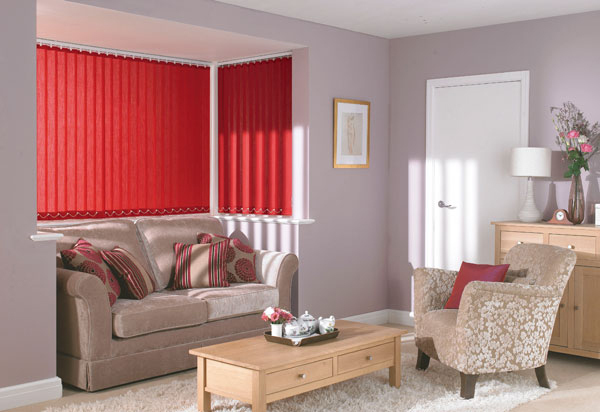 For instance, conservatories or sloped windows are a perfect choice to use these blinds. 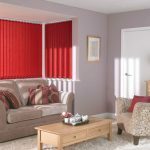 The long strips of fabric ensures a good choice of blind for patio doors. 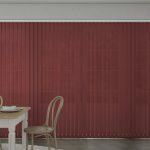 The blinds consists primarily of vertical fabric strips or slats. The slats, hang on a head rail using hangers. For one thing , the fabric strips, known as slats or vanes by many today. A bottom chain enables the slats to operate collectively in addition to the operational carriers. At the same time, control of the amount of light, using the a wand or cords leaves the customer in control. A wand together with the cords, manages, privacy. The wands ensures no cords hang down to pose a danger. However, the wand hangs in the middle of the blind. 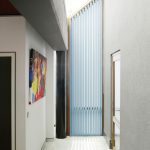 An ability to stack the slats to one side, in addition to allowing the slats to open like regular curtains have grown in popularity. All commercial verticals blinds are supplied with blinds safety features. A wand is meant to reduce the danger of strangulation. 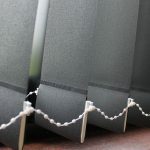 Alternatively, motorizing the blinds removes the needs for cords. Within the market a large array of fabrics are available. The range of fabrics includes patterned vertical blinds. Furthermore, plain colours offers a wide range of choice. 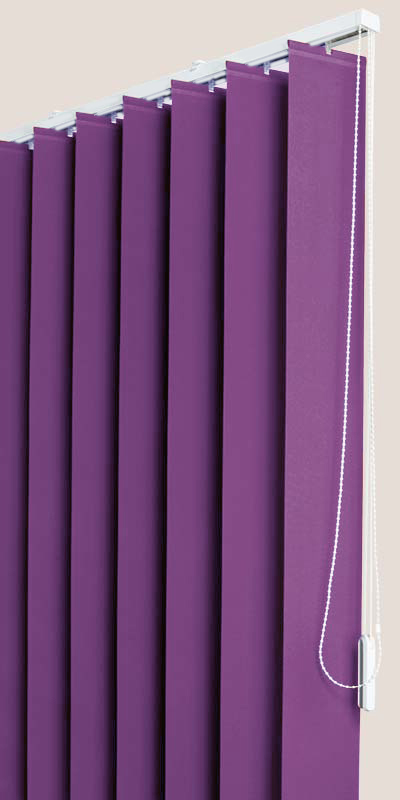 On the whole, fire retardant vertical blinds come in plain colours. 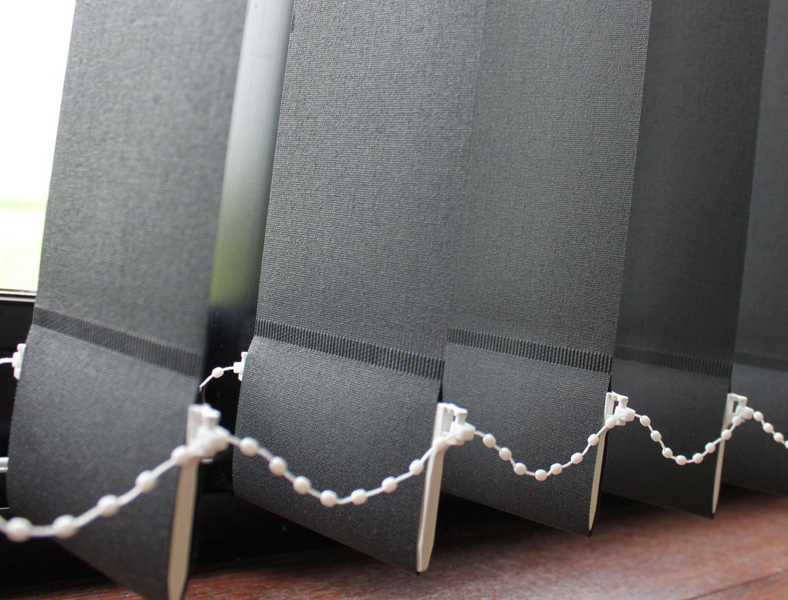 Blackout vertical blinds blocks sunlight. In general, the thicker the blackout fabric, the more expensive the material. However, light still bleeds around the edge of the blind. Solar reflective fabrics are widespread within conservatories. The fabric reflect the suns rays aiding in cooling a conservatory. Whenever, selecting a fabric suitable for these windows, fire retardant fabrics ought to be chosen. All fire retardant materials that have been tested to BS 5867 standards. Certain fabrics combine fire resistant material along with blackout properties. However, a halo effect, allowing light to bleed around the edges. Hence basic blackout vertical blinds permits light to seep through around the edges. 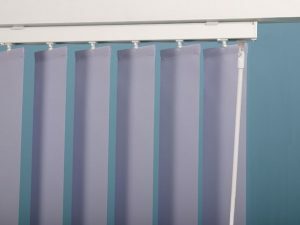 Of course, so long as the head rail is still operational vertical blinds replacement slats is an option. An important factor during an office refurbishment. Any chains that have broken can be removed and new chains as well as weights replaced. At times, It maybe prudent to replace the blind completely depending upon budget. How To Prevent Vertical Blinds Chain Breaking? Window handles pose a problem at times. Whilst pulling the slats across the window, there is a possibility of catching the chain on the handles. In order to prevent this, sewn in Sewn In Weights that allows the bottom pockets to be completely sewn up. Additional charge for the extra work is payable. An alternative option includes gravity weights which has a lip to prevent them slipping out our the pocket. Available in white only at no extra charge. Thereby, preventing any chain from being caught by the handles. As a result of the weights the slats still hang straight. 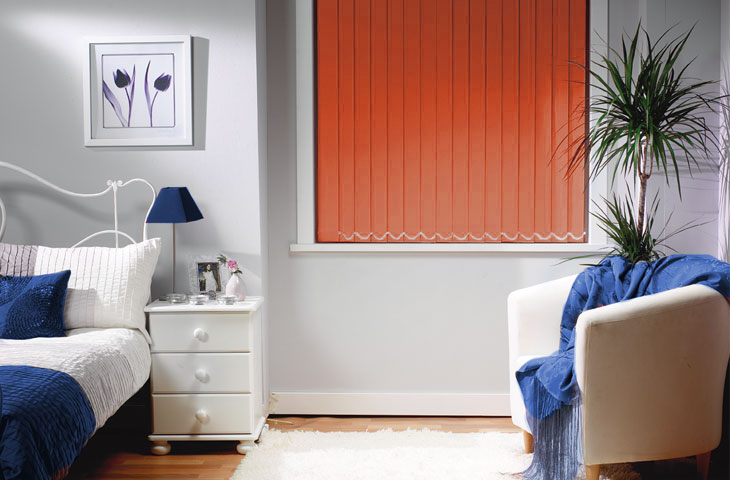 While basic vertical blinds are suitable for domestic windows. Additional options include crank control. For an top of the range option electric control is available. Additionally, vertical blinds for bay windows offers a good solution. Special measurements allows the manufacture of a curved head rail. Alternatively, sloped windows affords an opportunity to dress the window. Measuring the sloping width and base width. Following this, measure the drop of the shortest drop. Finally, the longest drop. All four sizes enables a blind to be made to measure. The controls always comes on the tallest side only. There is an additional 25% surcharge on the maximum width and drop. 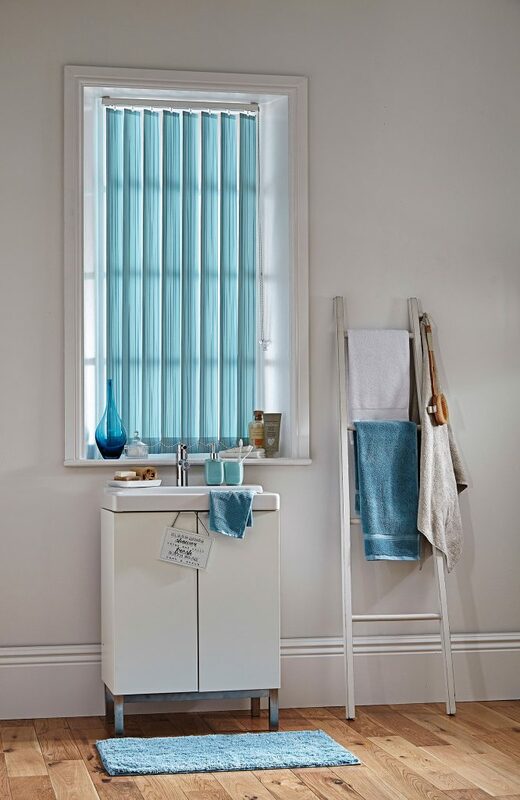 PVC vertical blinds offers a perfect solution for bathrooms. The price depend upon a few factors. For instance the banding. The bands runs from A-G, or 1 -6. The lower the band the cheaper the fabric. Also, A band is cheaper than G band. Cheap vertical blinds aids those on a budget. Other fabrics offer a range of price. 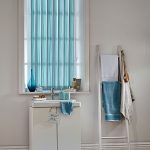 Prices range include cheap blackout vertical blinds to more more expensive fabrics. 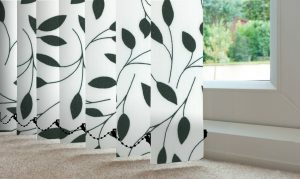 All in all vertical blinds in Milton Keynes provide a great practical window treatment. 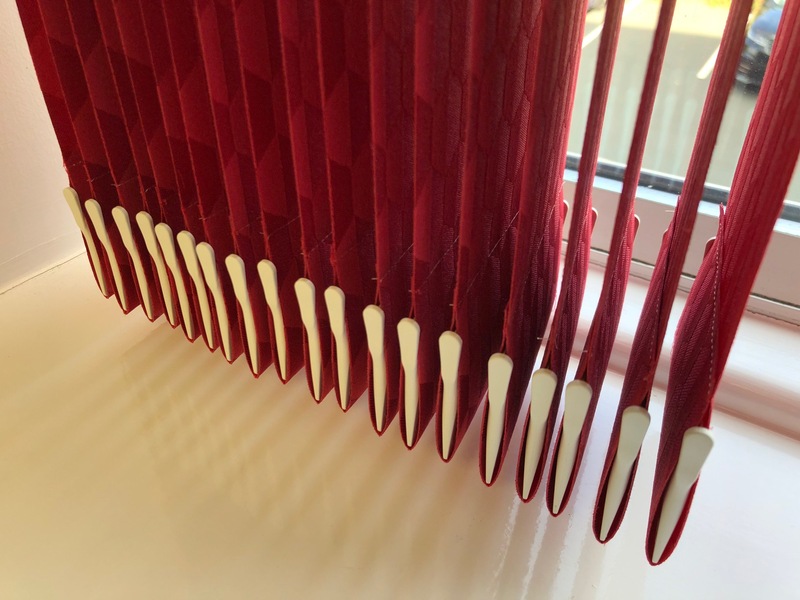 We measure, advise, supply and fit vertical blinds Milton Keynes. The choice of fabrics suit all budgets and decors. All Vertical blinds made to measure. 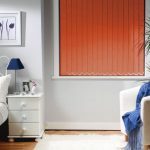 They are particularly suitable as commercial blinds. We provide vertical blinds quotes for new refurbished office in Milton Keynes.